For hundreds of thousands of years the Aurochs was a part of European nature. Since the death of the last aurochs in 1627 in the Jaktorow game preserve in Poland, it seemed that Europe has lost this key species forever. The history is about to change, though. European Wildlife organization in cooperation with the Dutch Taurus Foundation is preparing a project aiming to return the Aurochs to the mountains of Central Europe. Scientists have counted up that even if we managed to slightly decrease global temperatures gradually with getting the most strict measures through, the ocean surface would rise of more than 14 centimetres by 2100. Tomorrow in the countries of the European Union there will hold good a ban on selling classic bulbs of an output of 40 watts and less. The selling of classic bulbs of a higher output was on the basis of EU order finished even in the previous years. A profile article about European Wildlife organization has been published in the latest issue of a prestigious magazine Pan European Networks: Science & Technology. This is where conservation organization got a chance to present its main projects and priorities. 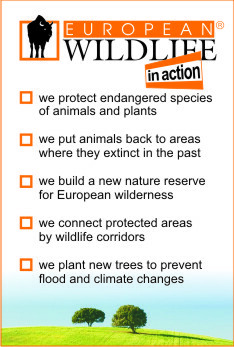 Especially a project of European Centre of Biodiversity and projects dealing with the return of animals which, in the past, became extinct, into Central European nature – particularly European bisons, wild bees or wild cats. Illegal wood logging poses an increasingly big problem in the countries of South-Eastern Europe. In Bulgaria, Albania or in the countries of former Yugoslavia there often disappear the whole forests because of that. Owing to a growing price of electricity, which is often used for heating in this region, and stagnating salaries is wood actually more often used for burning. Server EurActiv has brought that fact into focus.